Leicester have confirmed that wingers Gonzalo Camacho and Blaine Scully will remain with the club next season. American international Scully, 26, has made 16 appearances, including 13 starts this term. 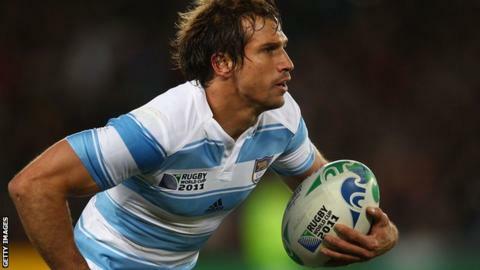 Camacho, 29, who joined from Exeter in the summer, is yet to make his Tigers debut after suffering a shoulder injury playing for Argentina in September. "He has not played a game for us but he is a quality international winger," said Tigers boss Richard Cockerill. Talking to BBC Radio Leicester, Cockerill continued: "He has had horrendous bad luck [with injury]. "In the marketplace where he is at, he is good value for money and we think we will get the best out of him." Cockerill added that Camacho could make his first appearance for the club against his former side Harlequins next week. "He is probably a week away," said Cockerill. Scully initially moved to Welford Road on a short-term contract this season after successfully trialling with the reigning Premiership champions. He started in Leicester's Heineken Cup quarter-final loss to Clermont on Saturday and earned Cockerill's praises for his efforts in both attack and defence. "Blaine has done very well. I thought his performance at the weekend was outstanding in lots of ways," said Cockerill. "He made the try [for Jordan Crane] with his footwork and offload. His ability to deal with [Naipolioni] Nalaga defensively and ability in the air was good."